What’s The Difference Between Blinds & Shutters? Have you recently purchased a new house, or are renovating your existing home? Maybe you just feel like updating your home’s décor and interior. Window coverings are one of the many things you’ll need to consider. With both shutters and blinds lasting many years, deciding which product to invest your money in can be tricky. We’ve put together the differences between shutters and blinds to help you make an informed choice for your home and make your decision a little easier. 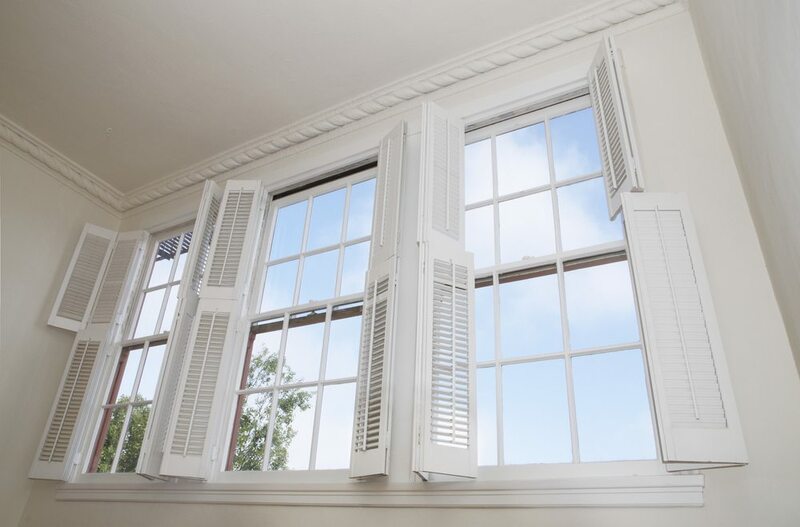 Shutters are custom designed, tailored to the exact specifications of your windows. As a fixed feature, they can add value to your home. Functual with a durability that will last longer than blinds. The slats of shutters can be conveniently adjusted to let in a desired among of sunlight and airflow, or none at all, giving you control over the light and ventilation of each room. Shutters are generally a higher-end, more expensive window covering option. Shutters come in a variety of manufacturing materials, including timber, vinyl, PVC, and aluminium. One of the most popular styles of shutters is the PVC plantation shutter style. Shutters can be installed on either the inside or the outside of the home. Blinds come in a variety of shapes and styles, with horizontal and vertical slats being the distinctive feature, occasionally with a sheer fabric overlaying the structure to maintain a level of privacy when open. Blinds are generally a less expensive option than shutters – a factor you may like to consider when choosing your window coverings. With their ability to keep heat out of the home, blinds are particularly beneficial for the Australian climate, with our hot temperatures and harsh sunlight. They’re also designed to gently filter light in and out of the room, and are a great way of stopping direct light coming into the house without blocking the view or making your home too dark in the daytime. Blinds can be made of timber, aluminium, fabric and plastic. If deciding to go with fabric, you’ll have an almost overwhelming range of designs and colours to choose from! For eco-friendly consumers, blinds can even be made with sustainable materials which achieves the look of wood and is more beneficial to the environment. Blinds are generally installed inside the house, becoming a strong feature of your home’s interior design and style. When discussing window coverings for the exterior of your house, shutters and awnings are generally more commonly used. Modern Blinds offer a huge range of blinds and shutters for Australian homeowners. Feel free to visit their Southport showroom to look at the many different styles of blinds and shutters, and see the differences between the two for yourself.